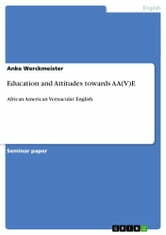 Seminar paper from the year 2007 in the subject American Studies - Linguistics, grade: 2,0, Free University of Berlin, language: English, abstract: The United States have witness a problem concerning educating African American students in elementary schools and high schools. One suggestion was that made in order to learn Standard English (SE) better is African American Vernacular English (AAVE) ought to be taught at schools to highlight the differences between the two dialects in order for the children to master their studies and to succeed not only at school but also later at college. 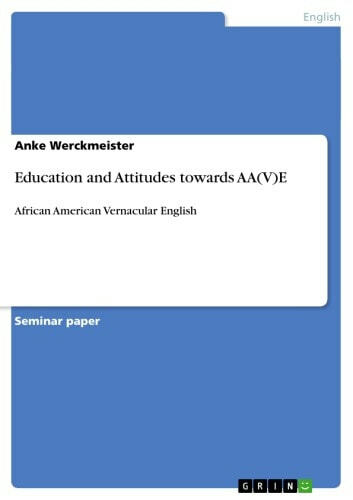 The problem is that many teachers, but also parents, have negative attitudes toward teaching AAVE at school because they think that this is 'bad' English and does not help to facilitate their lives. But I argue in order to get positive attitudes toward AAVE one has to understand the complexity of that dialect which furthermore needs to be translated to the teachers' training programs to help children acquire SE and master their lives.